The case: Glenn Gould Remastered - The complete Columbia Album Collection, from Tidal. A gold mine covering… 81 albums. There is no information about the composer. Roon has a lot of qualities. The player is top. But the treatment of collections is very bad for an expensive software pretending to offer - at last - good metadata. Actually, Tidal shows the information, although hidden in the track level credits. Too bad Roon is not capable of importing it. As you say there is absolutely no info so I’m not sure how any service would see this at a work, album level and make sense of it. I’d contact Tidal and complain. Tidal offers the information at track level. I am flexible enough to take it there. The point is that Roon does not even show that information. Of course, album level information would still be better. The misconception is as follows: Roon considers the whole collection as the album and does not feed any information at “disc” level. Actually the so-called discs are albums, so Roon lacks actually the concept of collection. Roon won’t show the track level information until it identifies the album. I’m not the best to help as I don’t really edit metadata but you need to get the top level identification correct, then the tracks will show with the inherited metadata. For works with several parts, there is a line for the work and n lines for the parts, that’s fine. The context menu for the work does not propose any credit information; why? The context menu for the parts has a “View credits” entry, which combiines the two lines (work and part) but the “Composers and performers” item says only: Primary artist, Glen Gould. There is no reference to the compmoser. This is no problem if you have a KV or HOB in the work’s naming; but when you only read “Concerto for piano and orchestra op. 42”, you need much musical culture to guess who is the composer. … What do you mean with “top level identification”? The collection or the “disc”? The collection is at the top and treated as THE album. The “discs” are in a way undefined. There is a misconception in the structure of the metadata database. 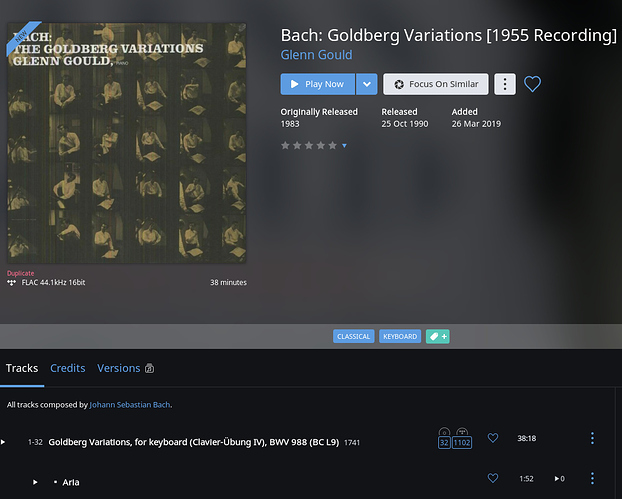 In Tidal, the same collection is divided into “Volumes” (equivalent to the discs in Roon). There is no information at volume level and no naming of the work, but each track shows the name of the composer in its credits. If you read something like “Sonata” you don’t have to guess whether it is by Mozart, Haydn or Ludwig van. Why is the information lost in the transfer between Tidal and Roon? Out of curiosity, I’ve just searched for, and added, this album from Qobuz, and I’m seeing something similar. That is, although Roon has seemingly got the Work/Part analysis correct, there don’t seem to be any composer credits - even though in the standalone Qobuz app, there are composer credits listed at the track level. One other interesting factoid - if the TIDAL version has 81 discs, why has the Qobuz version only got 78? Yes of course, the collection is made of previously published albums. And it happens that Roon sometimes shows these albums on the right side of the screen under “By this artist”, but only after I have played them. If I enter “concerto for piano and orchestra op. 42 Gould” into the search field, I get dozens of albums, which have nothing to do with the search criteria; the Columbia collection, o.k., but no other album with that concerto by Glenn Gould, which could allow for an identification. In Tidal, I discover a Columbia album with that work, written by Schönberg. Looking at Roon again, it is there, the third album in the hit list, between two Beethoven concertos by Gould and a Beethoven concerto by… Ronald Brautigam, which have no refence to the number 42. I confess I did not try to read the small characters on the thumbnail and the work mentioned below is the Concerto no 24 by Mozart, coupled on this album with the Schönberg concerto. Would the search in Roon have come up with only that album, I would have opened it and looked at the details. So yes, one can split this collection up, but it is quite adventurous! And there are other problems with Roon (besides the fact that it does not take all the information from Tidal) which don’t make it easy. I’ve just started using Roon recently, and I’ve imported a large library of around ten thousand albums. The problem is, is that the metadata was incorrect/wrong on many of these albums. As a result, they seem pretty much ‘lost’ in my library, and I can’t locate them in Roon. I’m sorry if this is a bit of a ‘Noob’ question, but is there any way to ‘rescue’ this stray music, without knowing what it is, and ‘where’ it is? If you are in Albums, you can Focus on “Identified”. Then by clicking Identified, it turns red and shows you all the unidentified albums. Then, you can begin the (tedious) process of editing and snooping to determine why a particular album is unidentified. That’s great John. A big help. Thanks again! For a point of reference, I have 3655 albums, 454 of which are unidentified. Most of the latter are 60’s rips of classical LPs which will probably never be added. But by editing WORK and PART tags, most of the content of those albums is IDed and linked to metadata. I am always available to rethink the way I do things. Others would prefer that the software meets their way of thinking and handling. This said, my “use case” is another one. I am not navigating the library but exploring Tidal. 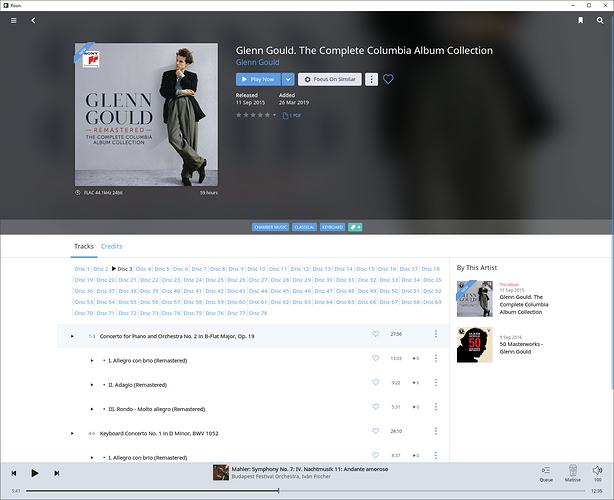 So I discover the Columbia collection of Gould recordings, 81 albums. I observe that composer info is available on Tidal, which is not available in Roon. This would be my minimum requirement. In addition, there is obviously a need to make more sense of a collection of albums. Someone has to be responsible for inputting the data into a server that relates to a particular CD/recording. And I’m sorry to say this, but the monkeys who they pay (presumably piecemeal?) just can’t be arsed to get the metadata right with classical. It made me dispair when I was ripping a CD recently of Ashkenazy’s Rach 2 & 4 with Haitink/Concertgebouw. The metadata was simply: I, II & III. For both concertos! Useless. I think classical music gets very short shrift overall, and it’s always been less ‘prominent’ than other genres. That’s why I prefer Qobuz over Tidal. They at least try and give some serious editorial time to classical. And it’s great. Tidal? Unless you’re looking for Jay-Z or Beyoncé, forget it! Mike, I feel and hear your pain. I recall reading some PR blurb about how Roon “understood” classical. And, to be fair, it does manage multi-track compositions pretty well. But other features lag. But, I’m a lifer, so leaving is a bit silly for me now. So why not make a Feature Request describing what it is that you as a classical listener would want to see on the Display screen?